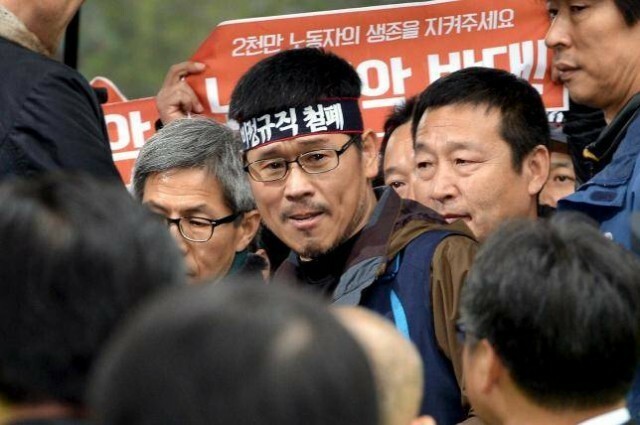 Han Sang-Gyun, the head of the Korean Confederation of Trade Unions (KCTU), surrenders voluntarily to the police in Seoul, Dec. 10. Since its founding in 1996 during a massive strike against anti-labor legislation, the Korean Confederation of Trade Unions has been in the forefront of resistance in south Korea. On Dec. 9, KCTU President Han Sang-gyun, who had spent the past few weeks in the Jogye Buddhist temple in Seoul, was arrested. Han, who remains in detention, is accused of inciting violence during a Nov. 15 mass labor and farmer demonstration that was brutally attacked. One participating farmer remains in a coma after a water cannon assault by police. The demonstration was called to oppose labor law changes proposed by President Park Geun-hye, changes which would force more workers, especially youth, into precarious temporary work. Han, who had been living for months in the KCTU office to avoid arrest on previous charges, emerged to lead the demonstration. After the protest, he sought refuge in the temple. While there are no laws granting sanctuary, state authorities do not typically enter a temple to carry out an arrest. In Han’s case, the temple was surrounded by hundreds of police. A similar number of monks and young Buddhists were guarding the temple entrance to protect Han. “If the police raid the temple it … will be tantamount to a state clampdown on the Jogye Order and on the whole Buddhist movement in South Korea,” the Order said in a statement. (Guardian, Dec. 9) Han turned himself in voluntarily, according to the KCTU. Han is a true hero of the Korean working class. In 2009, he led a 77-day occupation of SsangYong Motors, a car company that produces for the domestic Korean market. The main demands were against layoffs. The workers survived several police eviction attempts. Workers on the roof suffered skin burns from chemicals dropped on them. On Aug. 4, police stormed the plant where 600 workers were still occupying. Over 100 were injured, including two forced off the roof by water cannons. During the three years Han served in jail for his role in the occupation, 28 SsangYong workers died of injuries and conditions related to the police attacks. Because of their courageous sit-down, the Korean Metal Workers Union won some language limiting layoffs. Then, when SsangYong began reneging on the agreement in 2012, Han and two other auto workers climbed to the top of an electrical pylon. Han’s aerial protest lasted 177 days. Now, “we have no choice but to fight,” Han explained. 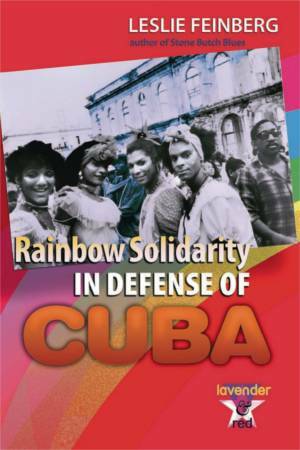 “KCTU is calling for a general strike despite all this because without a fight, what’s left of organized labor, the only means to defend the rights of workers, can ultimately become obsolete. The lives of 20 million workers are on the line.